“Chekka Chivantha Vaanam” is a subtle, succinct and searing tribute by Maniratnam to Quentin Tarantino. With unmistakable shades of “Reservoir Dogs”, assaulting the viewer in the closing phases of the movie, one of the most acclaimed directors in the annals of Indian cinema both delivers as well as disappoints. The innovative, ingenious and inimitable genius of Mani is explicitly missing in this movie. But the lack of originality is more than adequately made up for by a gripping plot, a flowing narrative and a couple of jackhammer twists that leave the audience craving for more. Senapathi (Prakash Raj) is the archetypal gangster, who after trysts with both death and destiny has carved out an unassailable niche for himself as sophisticated gangster of reckoning. He is assisted in the management of his sprawling empire by his eldest son Varada (Arvind Swami). Senapathi has two more sons deeply engrossed in managing their own business (legal and illegal) affairs overseas. While Thyagu (Arun Vijayakumar) deals with the Sheikhs in Dubai, Ethi a.k.a Ethiraj (Silambarasan) has his personal dalliance with arms dealers in Serbia. Senapathi and his wife Lakshmi (Jauasudha) on their way back from a temple are subject to a gruesome assassination attempt when two hired hitmen disguising themselves as policemen, fire at the car in which Senapathi and Lakshmi are traveling and toss a grenade inside the vehicle to make sure that the occupants are taken care of. Even though the couple barely survive, this tumultuous incident drives a vertical rift between the brothers who begin warring for power. In the meantime, Chithr (Jyotika) the wife of Varada, enlists the help of her husband’s close friend and a cop known for his volatile predilections, Rasool Ebrahim (Vijay Sethupathi) to shield her husband from any untimely and unfortunate exigencies. What happens next is a couple of hours of intrigue, intensity and incredulity. Arvind Swami as the self-professed heir apparent of Senapathi, essays a very suave and selfish portrayal. Fierce as an underworld don and fecund as a key protagonist in a dysfunctional family, this veteran actor is a joy to behold. Arun Vijay as Thyagu is refreshing. We see an uninhibited and smooth style, the credit for discovering which has to go to Manirathnam. This film might be the stepping stone for Arun’s future successes. Silambarasan as Ethi sizzles! If Arvind Swami is the engine of the movie, Silambarasan is the heart. Spontaneous, graceful and natural, Simbarasan carries the day in most of the scenes where he appears. His verve, vivacity and viciousness makes one wonder why an actor of such talent and caliber is such a poor judge of characters to be essayed by him. Directors of note and repute better watch this movie in general and Silambarasan in particular! But without an iota of doubt, Chekka Chivantha Vaanam is Vijya Sethupathi’s movie. This phenomenally talented actor has delivered a performance to be remembered, and has executed a role to be revered. As the abrasive, humorous, loyal and conflicted custodian of the law, Vijay Sethupathi dazzles, revels and regales his audience. While fans will drool over this performance, many will transform into fans! A Rasool Ebrahim, Sethupathi is simply brilliant. Whether it be dialogue delivery or the timing, this splendid actor leaves nothing to chance. While Jyothika and Prakash Raj are as usual effortless, it is a joy to behold the evergreen Jayasudha onscreen. The soundtrack by A.R. Rahman is haunting if not indelible and the Santosh Sivan’s Cinematography does not disappoint. The dialogues are appropriate and the stunts aesthetic. 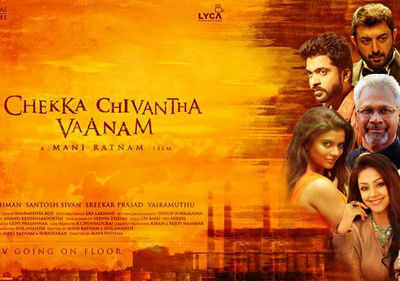 However, Chekka Chivantha Vaanam is both a highlight and a disappointment. A disappointment because this is not Manirathnam at his original best, but paradoxically a highlight on account of the overall context and content of the movie. Chekka Chivantha Vaanam – A drama in crimson! The movie is more than worthy of watching. Where a soft sense of disappointment seeps in is when you realise that the Mani Imprimatur is visibly absent. Maybe this is a signal that he is reinventing himself? Vague but crucial scenes shrouded in shades of dark (a.k.a the hospital fight scene in Agninakshatram ) is but one example. But what got my goat above all else was the climax, which even this great Director will agree that it is not his patented innovation. But having said all that, the movie is undoubtedly a superb entertainer.